Gerhardt's THERMOSHAKE Incubator Shaker is your sturdy solution for reliable homogeneous mixing of organic cultures at a constant temperature and speed in continuous operation. Based on the LABOSHAKE, Gerhardt's THERMOSHAKE is a sturdy, powerful incubator shaker that provides homogeneous mixing of organic cultures at a constant temperature and speed in continuous operation. Designed with precisely machined components, the THERMOSHAKE is capable of moving in a linear or circular motion while maintaining the stability of the platform. The onboard controller stores up to 9 programs with up to 9 steps each. Precise monitoring and a thermally-insulated chamber guarantee stable temperatures. Temperature remains constant to < 1 °C. The large window in the door and inside lighting allow cultures to be easily monitored. The fluorescent lamp can be replaced with a grow light or daylight lamp. 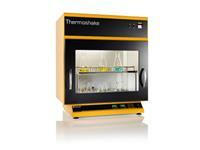 THERMOSHAKE offers all the benefits of the LABOSHAKE, as well as accessories for a variety of applications.